Each of these biotech stocks looks poised to put up impressive growth next year. 2015 is shaping up to be another good year to have had money devoted to the biotech sector: The SPDR S&P Biotech ETF (NYSEMKT:XBI), an exchange traded fund holding a collection of 103 biotech stocks, is currently on pace to outperform the S&P 500 by a healthy margin. Of course, while the biotech sector in general did well during the year, there were several biotech stocks that crushed the returns of the ETF. 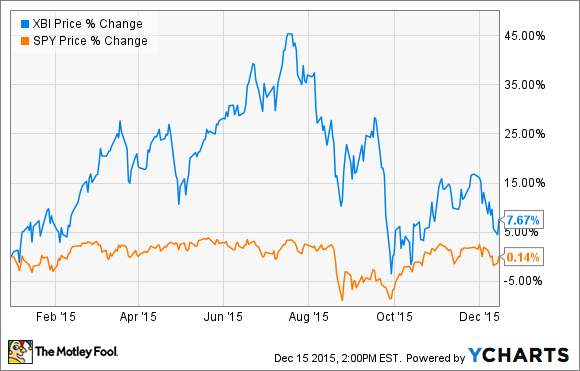 So which biotech stocks will be on top in 2016? There's no way to know for sure, but each of the three biotech stocks listed below has positioned itself for explosive growth in the coming year, which makes me believe that they could be big winners in the year ahead. Vertex Pharmaceuticals (NASDAQ:VRTX) has been a winning stock for a long time; shareholders who got in at this biotech's IPO are up more than 2,500%! Yet despite its huge past successes, I think that the odds are high that the good times will continue to roll in 2016 for the leader in cystic fibrosis treatment. Vertex's sales have been grown quickly in recent years thanks to Kalydeco, its current best-selling cystic fibrosis drug. Kalydeco shows no sign of slowing down in 2016 either, as it recently won European approval for two new indications. Kalydeco is also poised to receive some more good news in February. The FDA is currently reviewing another label expansion opportunity; if all goes well, it could grow its addressable market by another 35% or so. Add these together and 2016 should be another good year for Kalydeco. However, the reason I'm so bullish on Vertex's stock is because of another cystic fibrosis treatment -- Orkambi -- that will be rolling out during the year. Orkambi received regulatory approval in both the U.S. and the European Union in 2015, and its labeling will allow it to address a much larger portion of CF patients than Kalydeco could on its own. That should allow Orkambi to ramp up its sale at a much faster rate than Kalydeco. Adding the Orkambi opportunity to Kalydeco's label expansion, analysts are currently projecting Vertex to show total revenue of $2.4 billion in 2016, which is substantially higher than the $1 billion that it is expected to produce in 2015. That amount of revenue will allow Vertex to become profitable, so I could easily see its shares soaring higher in 2016. For years, Alexion Pharmaceuticals (NASDAQ:ALXN) has been a one-drug story, with its entire financial picture reliant on Soliris, an ultra-expensive drug that treats two rare diseases -- paroxysmal nocturnal hemoglobinuria and atypical hemolytic uremic syndrome. Alexion Pharmaceucials investors have done very well over the years as Soliris has shown explosive growth, but in 2015, Alexion Pharmaceuticals won regulatory approval for two new drugs that should lead its stock to a successful 2016. Strensiq and Kanuma, the company's new treatments for hypophosphatasia and lysosomal acid lipase deficiency, respectively, both scored regulatory thumbs up in the U.S. and the European Union. In addition to giving the company much-needed product diversification, both are estimated to reach $1 billion in peak sales. When the potential sales of those two news drugs are combined with the continued growth of Soliris, it is clear that Alexion Pharmaceuticals has positioned itself to show huge growth in 2016 and beyond. Adding a $1 billion share-repurchase program to the mix doesn't hurt, either. Regeneron (NASDAQ:REGN) has grown into a $56 billion behemoth thanks to Eylea, its therapy for age-related macular degeneration and diabetic macular edema. Eylea sales grew 53% in the most recent quarter to more than $1.1 billion, and after the therapy got regulatory approval for several new indications during the year, 2016 should see strong growth as well. But there's more to the Regeneron story than just Elyea. In July, Regeneron and its partner Sanofi (NASDAQ:SNY) announced the FDA approval of Praluent, a new cholesterol-lowering medication. Sanofi and Regeneron believe that there are more than 8 million Americans who could benefit from using Praulent, and with its wholesale cost running north of $14,000 annually per patient per year, it wouldn't surprise me to see Praluent reach blockbuster status in its first year on the market. That could turbocharge Regeneron's revenue growth in 2016 (and go a long way toward helping Sanofi reach its 2020 goals). Even better, Regeneron also boasts a handful of drugs in phase 3 clinical trials, including sarilumab, a potential arthritis treatment, and dupilumab, a potential treatment for eczema and asthma. Both are estimated to hold blockbuster potential, and sarilumab could even be under regulatory review before the end of 2015. With Eylea poised for continued growth, Praluent hitting the markets, and two more potential blockbuster drugs waiting in the wings, Regeneron is poised to put up some serious growth in 2016 and beyond, which leads me to believe that shares could see plenty of upside in 2016.